Topping off your coolant a little more often than you used to? If it’s been 60,000-90,000 miles since you’ve last changed it, it could be the water pump. Watch this video to see if this free diagnosis breakdown can help you pinpoint the issue before hiring a mechanic to diagnose. How to Diagnose Scraping Noise Brakes or Dust Shield? You know your brakes are good. You changed them not long ago. But then you hear a scraping from that area. More often than not, it’s actually the dust shield rubbing against the rotor. You’re in luck in this case, because if that is the issue, it’s a quick and easy fix that will cost you nothing! When driving on the highway feels like you are sailing the seas, that bounciness isn’t your car dancing. The lack of stabilization likely means there is an issue with the suspension. Shocks and struts are some of the most common suspension parts replaced. Here we’ll show you the best way to tell if those parts are well worn. Is your vehicle often running low on oil? An oil leak in your valve cover gasket could be the culprit. If you see smoke coming from your engine, give this diagnostic video a watch. If it is the problem, then save hundreds of dollars doing the valve cover gasket replacement yourself! Many Chevy Traverse owners were able to save around $100 replacing their ambient temperature sensor using with this free video. See how it is and decide if you can do it. Some repairs are easier than you think. Here’s a common maintenance repair for a common vehicle. If you own a Honda Civic between the years of 2006-2011, you can use this easy-to-follow video as a guide and save yourself the hassle of taking it to a shop, waiting around, and getting rides while your car is being worked on. Fog lights. You know, extra headlights you don’t think about until you have to use them on those extra foggy nights. Did you know you can upgrade those fog lights to something more powerful? Many novice DIYers get weary cutting into the bumper and dealing with wires, but this how-to video breaks each step down in a simple way to help get your car upgraded successfully . Headlight assemblies get cloudy, faded, yellowish, cracked, chipped, and wear out over the years. It’s no wonder they are often replaced. Headlight restoration kits are amazing but we feel that they are only a temporary solution. We believe if you are going to do a job, do it right the first time. The ultimate goal for any headlight job is fulfilling one objective: increase visibility at night. You can spend an hour sanding, polishing, buffing, and cleaning your headlights until they’re slightly clearer – or in the same amount of time, you can buy replacement assemblies, follow our how-to videos, and see more often than not it’s a simple fix (and a long-term one at that). Seats rarely need replacing. They’re usually taken out as a step in a different repair or to make room for more storage. Either way, if you need to remove your seats, you’ll have to know how. Some directions are not as straightforward as others (like pulling a quick release tab), so for the more challenging vehicles that require tools, like this 2008 Honda Civic, we have a video for you! Water pump replacements can cost between $500-$800. We want you to save as much money as possible by showing you how to do it yourself. 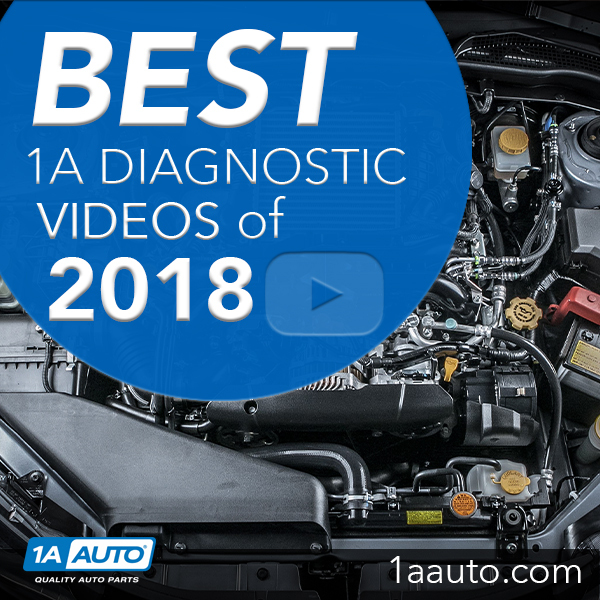 Many Chevy Traverse owners have benefited from this as the tenth most popular video made in 2018. Water pumps are in every vehicle, so don’t worry if you don’t drive a Chevy Traverse. We have other water pump replacement videos for many other vehicles! We’re pleased to know these videos helped so many people save money fixing their own cars this year and will continue to help others going forward. Our goal for next year is to help you save even more money by using our how-to videos for a wider array of repairs. Find a video for your model in our video library. Use these videos to help you into the new year, and whenever you need parts, check out 1aauto.com!